Hello again, stamping friends! Well, I hadn’t planned on being away from posting for the last few days – but a powerful windstorm took the decision out of my hands! You may have seen it on the t.v. 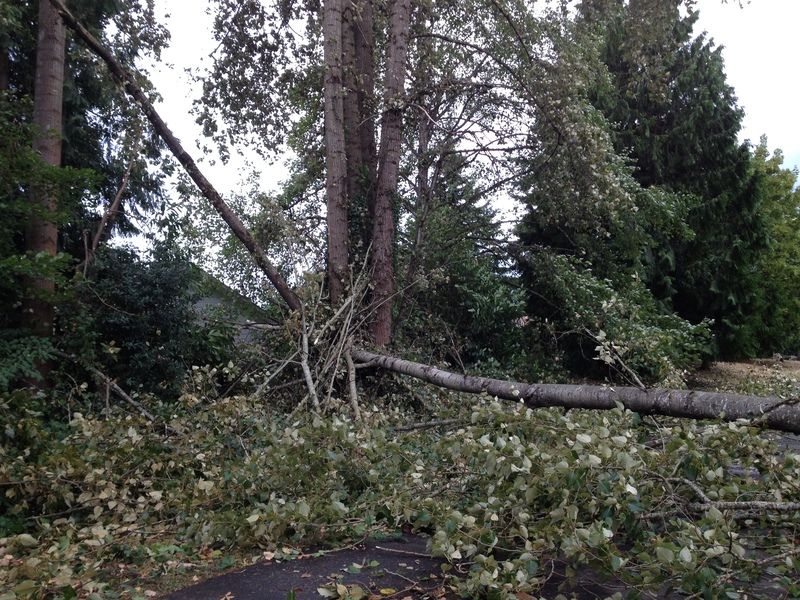 news – our area (lower mainland British Columbia – Vancouver) experienced some crazy wind over the weekend, and as a result, a lot of people have been without power, internet and cable. We were one of the fortunate areas; our power was restored on Saturday afternoon; people in some areas are still without power – my parents only just got power back this afternoon! It was super windy, with gusts up to 90 km h, which resulted in of course trees knocked down everywhere; here are a couple that went down behind our house – thankfully they fell away from the house, and missed our neighbours, as well. 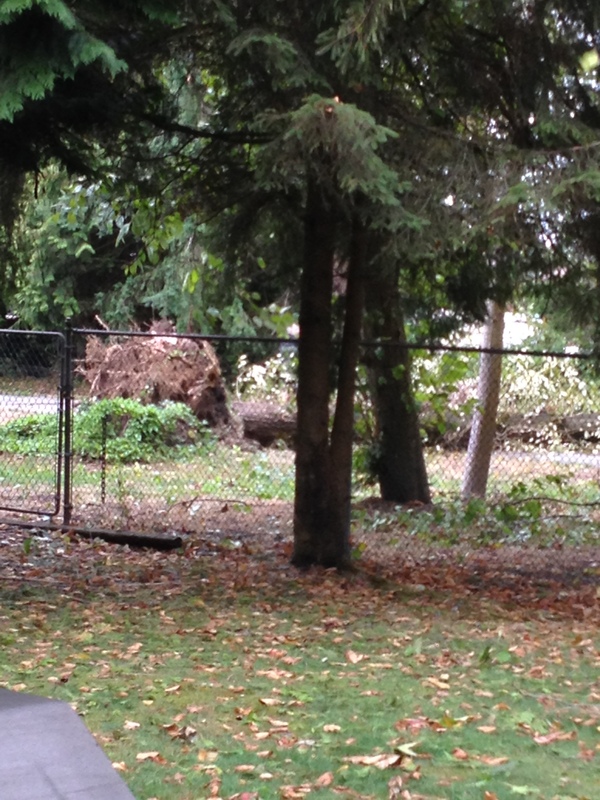 This is looking out our basement door – you can see how the tree was totally uprooted, and is laying right across the back path. 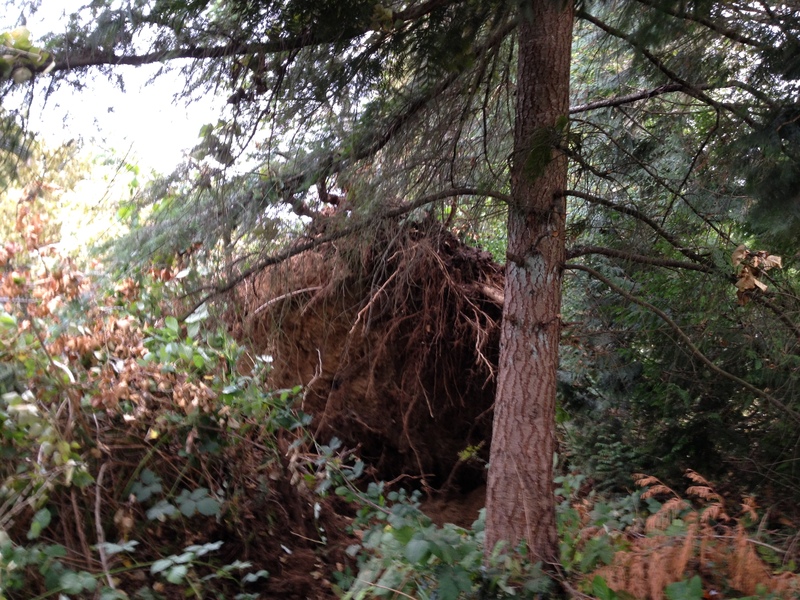 This one fell amongst the other trees; I could only safely get a picture of it’s root ball. I’m not sure if the top 1/2 of it landed in the neighbour’s yard, or if it landed on the outside of their fence. So – back to stamping news! 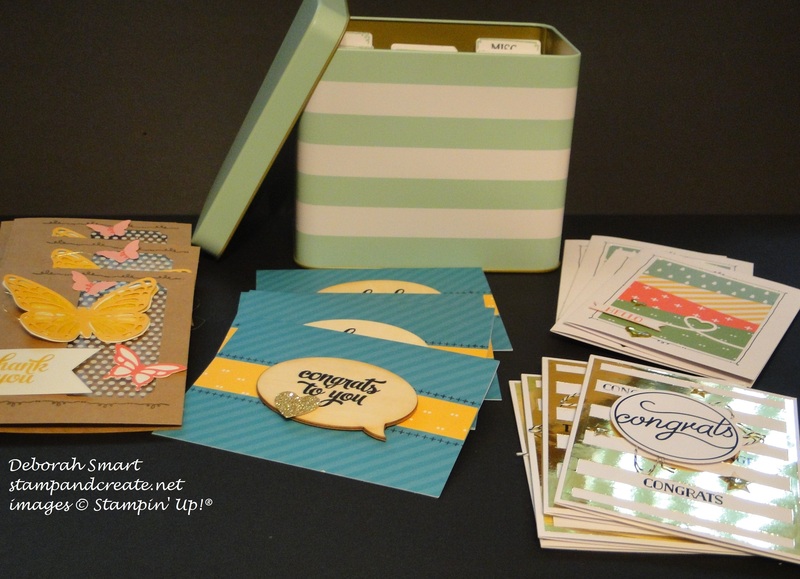 There’s still time to sign up for my Tin of Cards Class – I just checked the backorder report, and it looks like the kits won’t ship until September 11th, so I will be rescheduling the class to September 18th. These are the completed cards – I just finished putting my kit together! 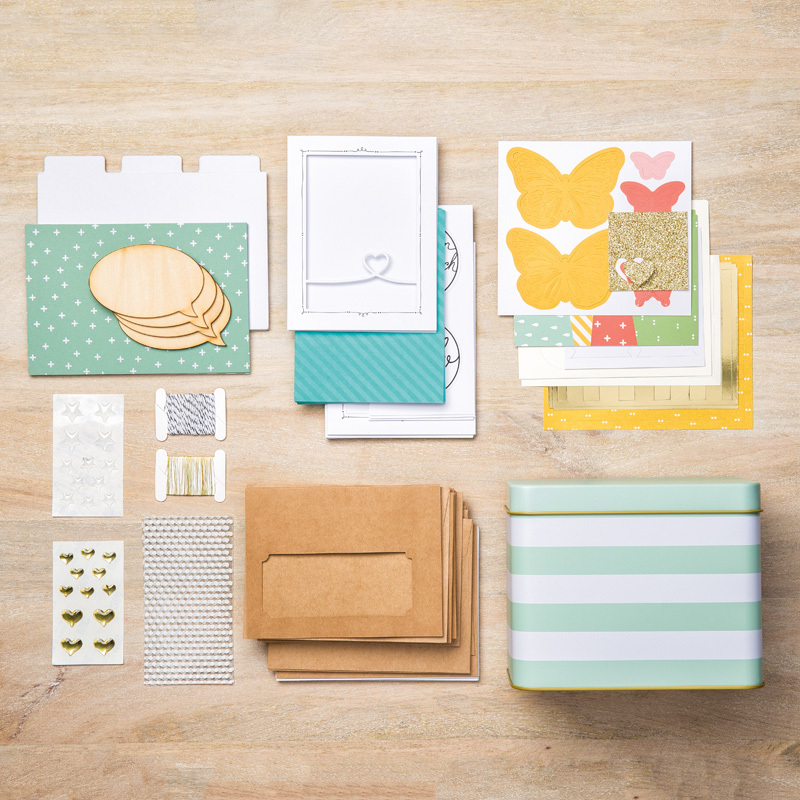 I love this kit – it comes with everything to make 16 cards; 4 each of 4 designs, plus the cute tin to keep them in! All card bases, layers, die cuts & embellishments are included in the kit. At the class, you’ll use my stamp set, inks and any additional adhesives needed. The cost is $40 – please RSVP by tomorrow – Tuesday Sept. 1st so that I can pre order the kits. Either email me at debsmart@shaw.ca or call me at 604.298.0472 to register. If you want to order, but can’t make the class date, we can work that out, too! How about a private class for you & your friends? 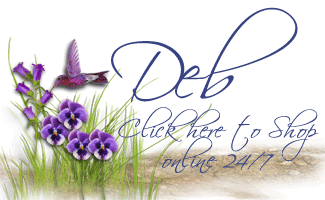 I’ll be back tomorrow with the new Weekly Deals – in the meantime, be sure to check out my Events page for all my upcoming classes! Be sure to register ASAP, as space is limited! Previous Previous post: Colleen’s Stampin’ Up! Party Fun! Next Next post: New Weekly Deals!